So earlier this week my wife sent me to Ralphs Grocery Store on Verdugo to pick up some coleslaw. 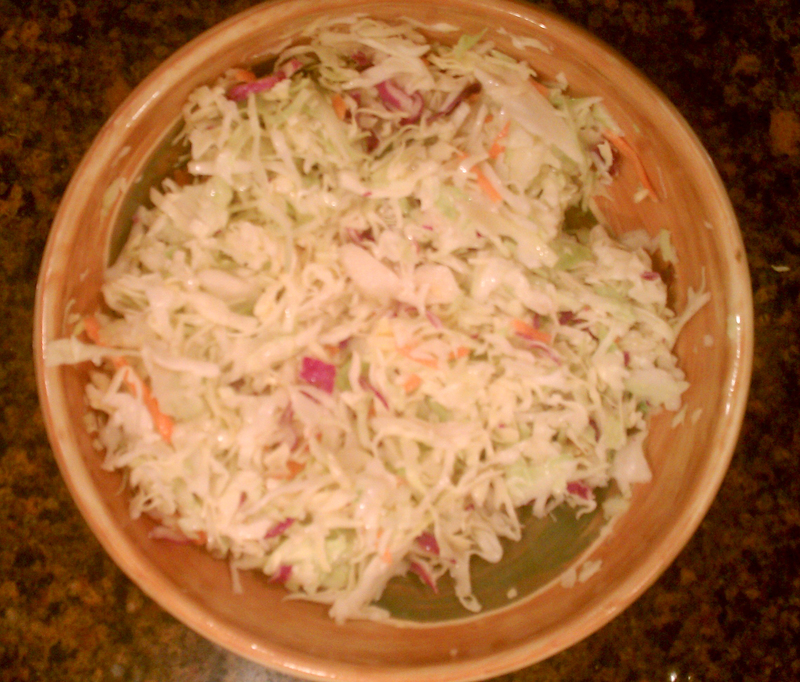 She had planned a great meal of shredded BBQ Chicken Sandwiches and that of course calls for some tasty Coleslaw. Well, wouldn’t you know it I got to the Deli Counter and low and behold they were all out of coleslaw! Whats a intrepid husband to do? Make my own Coleslaw of course? So I did. Sorta . 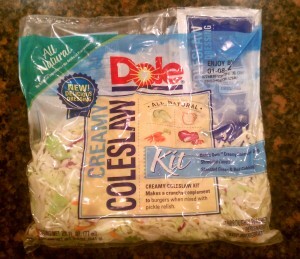 You see I went over to the produce section and I was looking at the carrots, cabbage etc when I noticed that Dole was selling Coleslaw Mix in a bag. Yup, thats right. 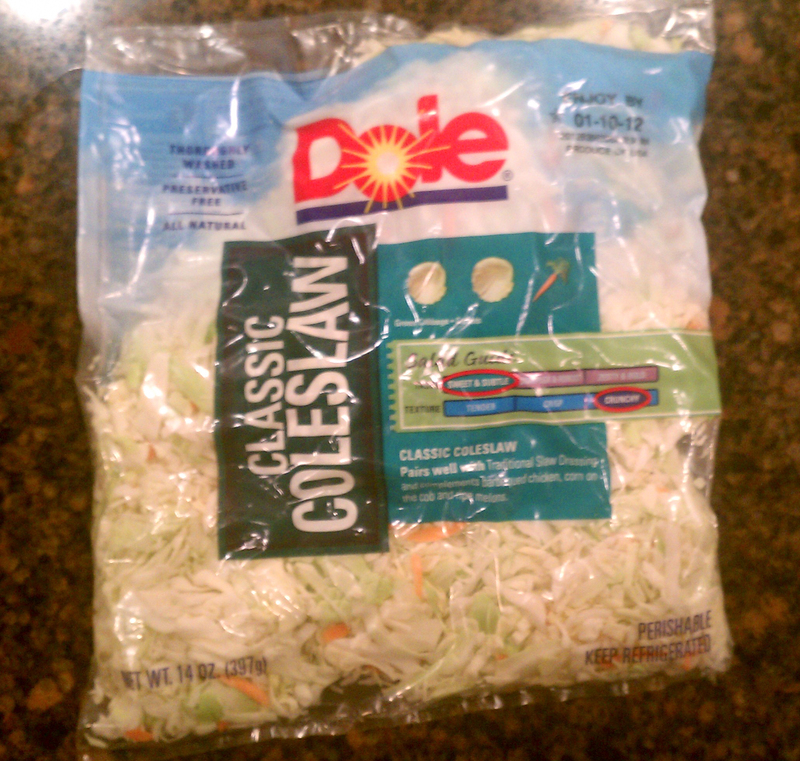 Coleslaw in a bag! In fact they were selling to different types. So I did want any other coleslaw hunting husband would do, i bought both! Crazy? Perhaps but thats how the Dads roll in Glendale! The first one was the more expensive. It was about $4.50 for the complete mix. 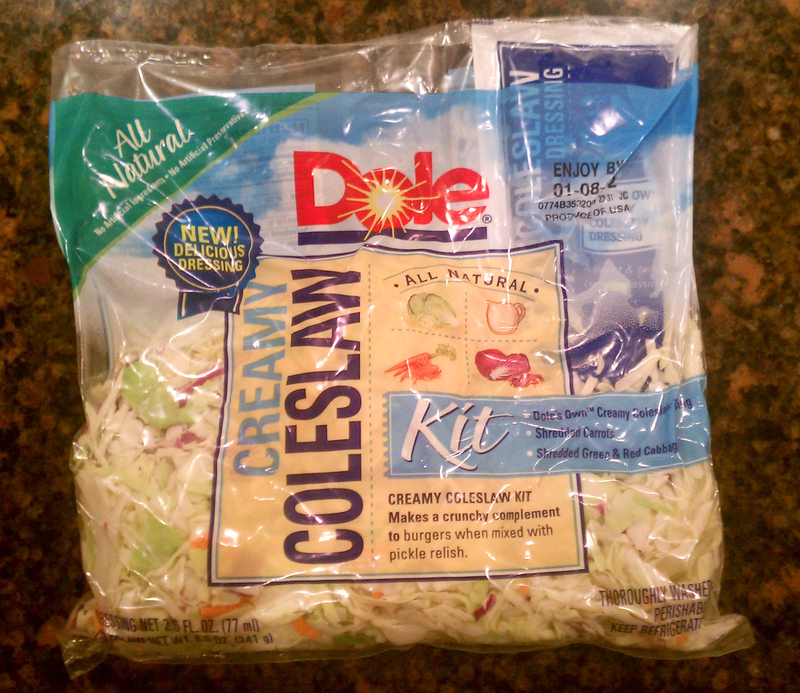 It included a large bag of shredded cabbage, carrots and other coleslaw veggie stuff, and it came with a pouch of coleslaw dressing. When I took it home it was pretty easy to assemble. I just emptied the bag of cabbage and veggies into a bowl, tore open the dressing and mixed it together. 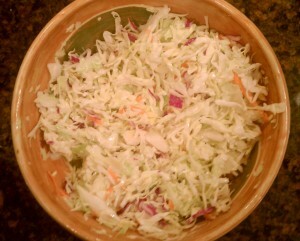 It took me less then 5 minutes to have it ready and in the fridge chiling (cuz I do like my Cole Slaw chilly). The second choice was cheaper. Or was it? So this second bag only had the shredded cabbage, carrots and other “raw materials.” There was only raw veggie type stuff and no pouch of dressing. However there was a recipe on the back of the bag and I decided that I was going to try to make it! So I did!!! The truth is that I was going to include the recipe here for everyone to try but I forgot and I threw away the bag! Oops! However I can remember most of what was in it (but not the proportions). The thing about this less expensive bag was that while it was only $1.49 for the bag I still had to buy all the ingredients. Dollar out of the pocket was about the same but I did still have lots of ingredients left over. 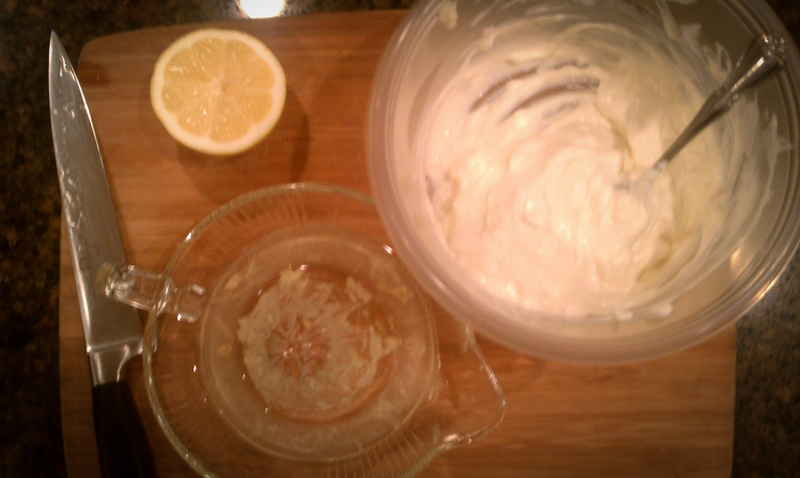 It’s true that in our house we always can use more sour cream and sugar the other stuff I’m not so sure about. Okay, okay. I know get to the point. I know that the big question was… How was it! I have to say that both were pretty good. Our survey pool consisted of 5 adults and two kids. The kids tried it and weren’t really interested. So they don’t count. While everyone was amazed that I made the Coleslaw dressing and they said that it tasted okay they thought I over did the mustard stuff and that it was a bit too spicy for their taste. The more popular choice by far was the pre made dressing in a pouch! While I have to admit that $4.5o seems a lot to me to get shredded cabbage and carrots with some dressing I would be remiss if I didn’t mention that we had enough of both items left over to mix together and thats when everyone fell in love with the coleslaw. Which one is better is hard to say but it was definitly fun to try out both recipes and have a taste test! Oh and I would be remiss if I didn’t mention that the Dole website that deals with coleslaw praises the positive health benefit! I’ve copied it below! 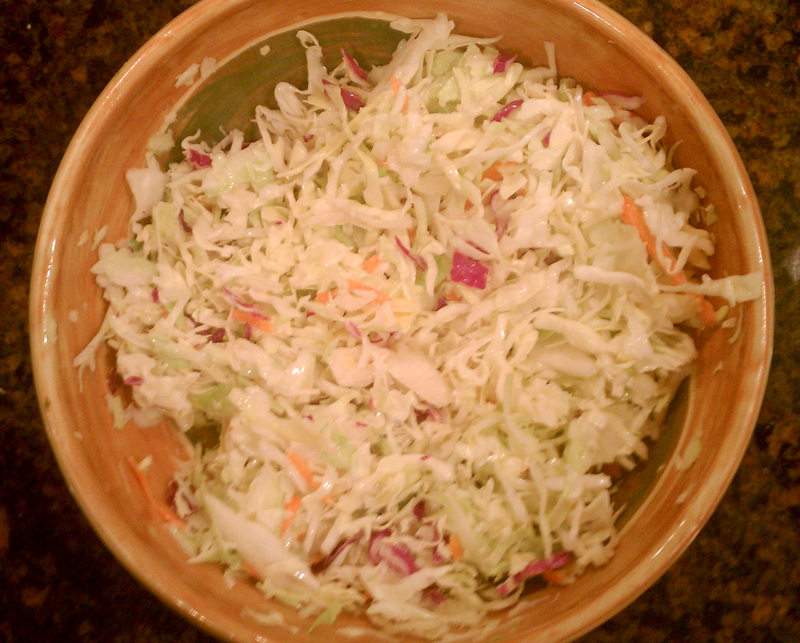 Where do you get your coleslaw? Whats your favorite? Got a recipe to share?